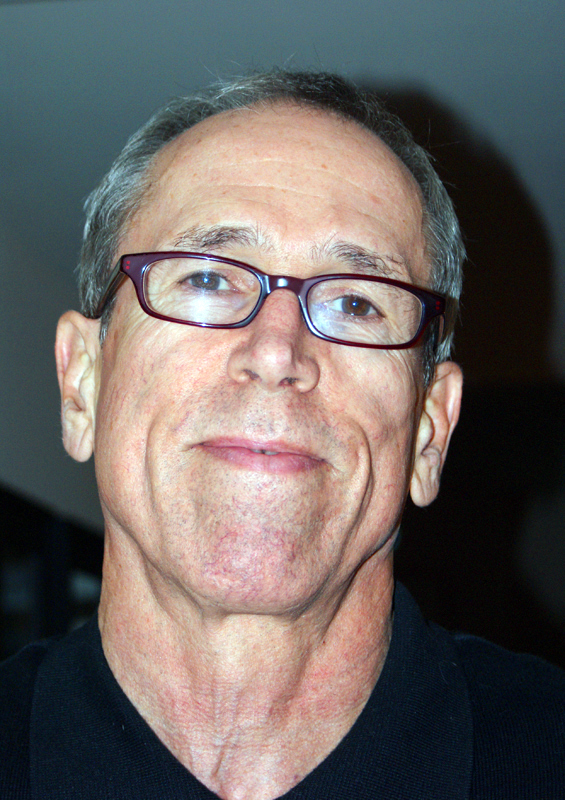 Teaching Authors--6 Children's Authors Who Also Teach Writing: You Can Sit on my Poem in NC! 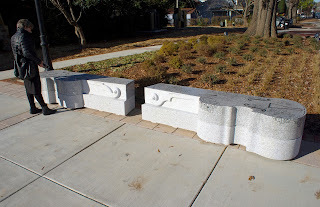 Oh, this is so much better even than I anticipated, since my community in Bethesda, MD, put several wooden bus-stop "poetry benches" in place about 15 years ago. 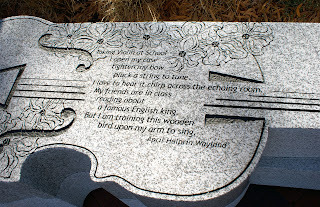 They are carved and painted with poems or excerpts, and wonderful to come across, but Cary's benches are part of something so much bigger! Loved the interview, and again, what a thrill--congratulations! So much delight and wonder in this post! Mr. Mackie sounds like a terrific conduit for poetry and community. Congrats, April! 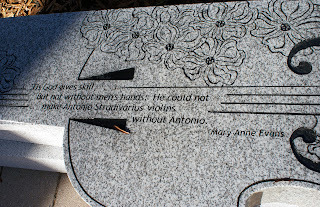 We have a small little park nearby that has etchings of poems in the cement of the flower beds, April. Wow, what a wonderful thing for you, and for your poem. I can feel your delight from your words, and enjoyed meeting Jack and hearing all about this project. Nothing better than a sweet piece of mail! Happy Summer! Wow, what an amazing project! Thanks so much for sharing it with us. I can see why Jack wanted to include your poem, April. I especially love the image of training the wooden bird to sing! Congratulations! Oh my gosh. 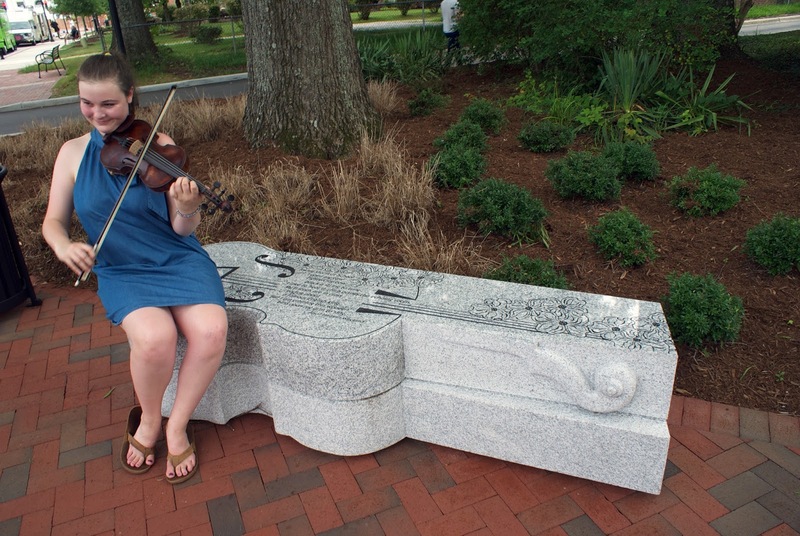 That violin bench is gorgeous! Congratulations, April. I have some friends and family in NC. I'm going to pass this post along to them in hopes that they can visit the poem/art. Yes, definitely gone to heaven if I were in your shoes. More than anything, its such a beautiful way of incorporating poetry and art. Congratulations to you both for such a lovely project/collaboration. Those are glorious. What excellent company you are in, April. I lived in Cary for awhile, but they didn't have anything like this, then. How fabulous! Oh April, this is so wonderful! And as Brenda said, that's quite an elite class of poets you're hanging out with. Congratulations! Wonderful, lyrical sounds emerging from this post April, many congratulations to you and Jack Mackie! Your poem is lovely, a moment in time singing a song, thanks for all! Thank you, community of poets! It's nice to have good news come out of left field. And, to be completely honest, I think I write for a tiny bit of immortality...to be preserved somewhere as history. Do you, too? Well, wowzer!! 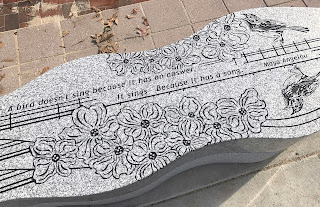 You are a bench along with some poetry greats--how amazing is that?! So pleased to read about this, April! 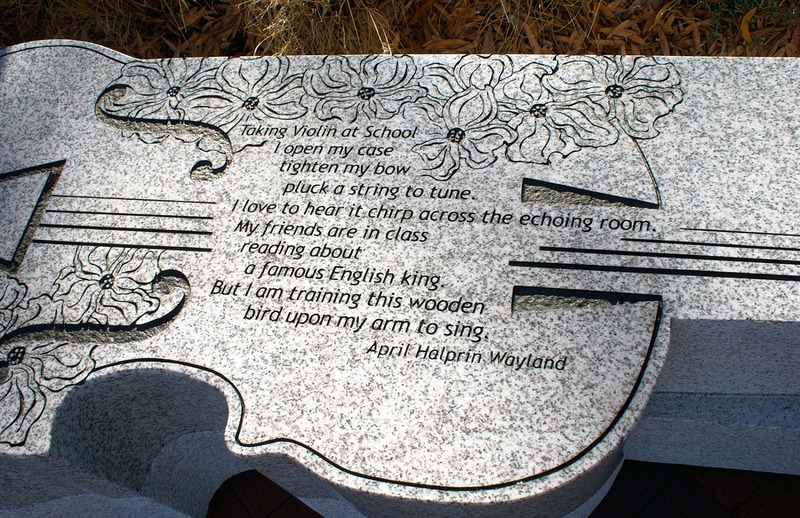 How perfect for them to include a children's poem/poet (as violinists usually get a very early start). And what a gorgeous project. This is just the coolest thing ever! Congrats on having your poem selected for such an amazing project. This makes me want to plan a trip to NC. Nothing better than the combination of poetry and art! April - this is amazing! You know, this is the first poem of yours I ever read! 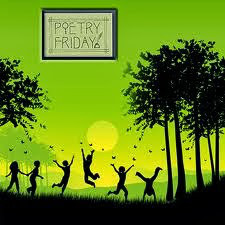 I love this poem and I love the work your friend is doing! How exciting and wonderful, April. Congratulations to you, the artist, and the town! What an amazing opportunity! 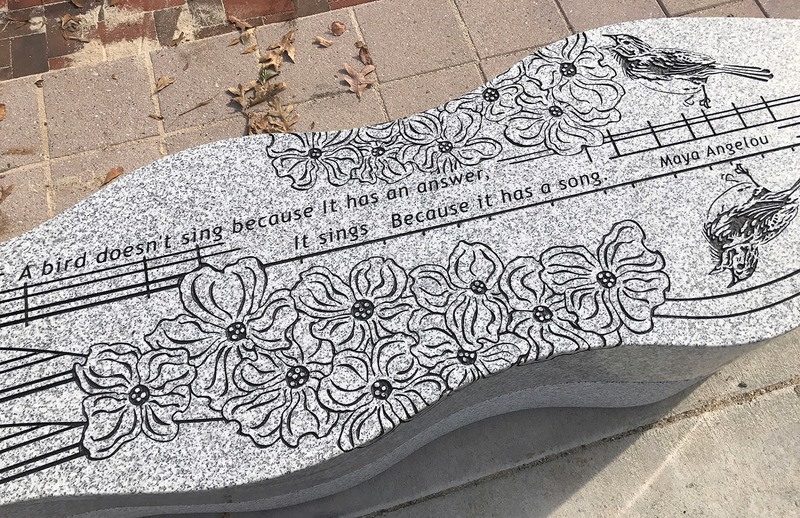 I love projects that bring poetry out of the classroom and the library and out into the world for everyone to celebrate, experience and enjoy! Buffy ~ amazing. Exactly the word. Yes, Violet--I'm glad that he did choose a children's poet. And this bench is steps away from the library and a violin studio! BJ ~ Thank you. This poem is the first one my mentor, Myra Cohn Livingston, praised--she was spare with her praise. It's had a life of its own--reprinted often. Anna and Jane ~ thank you! 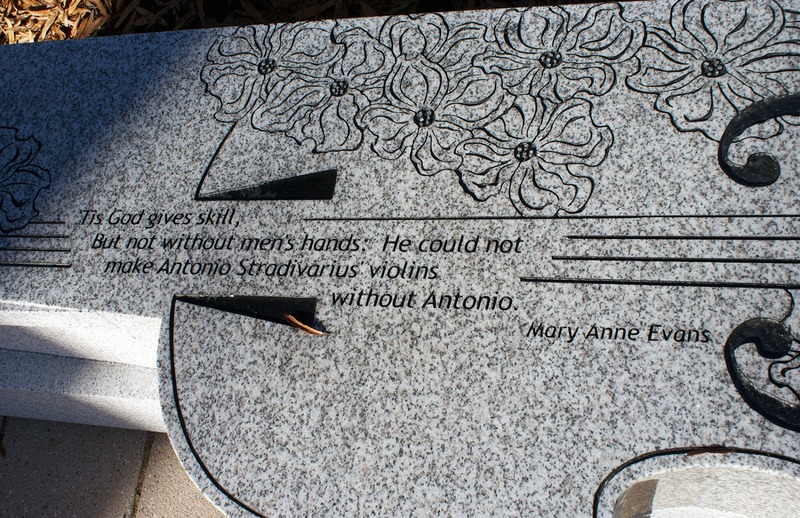 Kathryn ~ I hope this spurs you to take out that violin manuscript. Never have too many of music books!